Cloud Ceiling Panels: Where do the Sprinklers go? Cloud ceiling panels are a ne w interior design trend in which a building with a high unfinished ceiling has panels at a lower level with lights attached to them. This creates a kind of ‘faux ceiling’ which draws attention away from the high ceiling. The effect can be modern, artistic, and add texture to a room, but… where do the indoor sprinkler system heads go? For a long time, commercial sprinkler systems had to be installed on both the cloud ceilings and the actual ceiling, but the NFPA has revisited these rules since the cloud ceilings have become more popular. The original thought was that the cloud panels will block water from reaching the floor of the building where the fire would be. Therefore, cloud panels would have fire sprinklers installed on them too so that the sprinklers would be closer to potential fire sources. After running certain tests, officials have determined that there are some cloud panel situations that do not require so many sprinklers. By following certain guidelines regarding the size and distance between each cloud panel, sprinklers may only be installed in either the cloud ceiling or the true ceiling. The distance between the true ceiling and the cloud ceiling is also a factor in this rule. In order to be effective, sprinklers must cover a certain range of area in the building, vertically and horizontally. If there is enough space between each cloud panel and they aren’t too far from the ceiling itself, it is safe for sprinklers to only be installed on the ceiling. Likewise, if cloud panels are very close to the actual ceiling, sprinklers would serve better if installed on the panels themselves. If your building has cloud ceiling panels and you have questions about where sprinklers should go, make sure to contact a professional at Total Fire and Safety, since the NFPA regulations have been updated. You can reach us at 630-324-0092. Category: Sprinkler Systems, Total Fire and Safety, Trends Tags: ceiling panels, cloud ceiling, cloud panels, fire safety for ceilings, NFPA cloud ceilings, NFPA code, sprinkler cloud ceilings, sprinkler heads, sprinkler installation, sprinkler installation on cloud ceiling, sprinklers on cloud ceiling | Comments Off on Cloud Ceiling Panels: Where do the Sprinklers go? 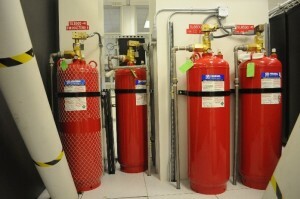 Many businesses are choosing clean agents in order to safeguard their assets- data stored on computers, expensive electronic equipment, and anything that could be destroyed with liquid, especially certain chemicals sometimes found in commercial fire suppression systems. Clean agents are a new kind of suppression system for the 21st century, because they are computer-friendly. These clean agent systems release gaseous chemicals instead of liquid, which prevents electronics from being damaged by a fire suppression system. Clean agent systems are therefore preferred in areas like data processing centers, telecommunications facilities, medical diagnostic rooms, laboratories, clean rooms, museums and art galleries, etc. There are certain dangers that go along with clean agents, however. Since the gas must fill an area in order to achieve its full effect, the pressure and volume of the gas must be carefully regulated. Suffocation is a possibility if people are trapped in a room when a clean agent system is activated. However, alarms are always in place to alert people in plenty of time to evacuate the area. Another potential danger occurs if the gas creates enough pressure to break walls or windows. Suppression system experts can make sure that the system is adjusted so that the pressure in a room will not reach dangerous levels. In the case of an accidental activation of the suppression system, a traditional sprinkler system can cause thousands of dollars in property damage. Clean agent suppression systems are a way to avoid this risk while still protecting your business from fire. 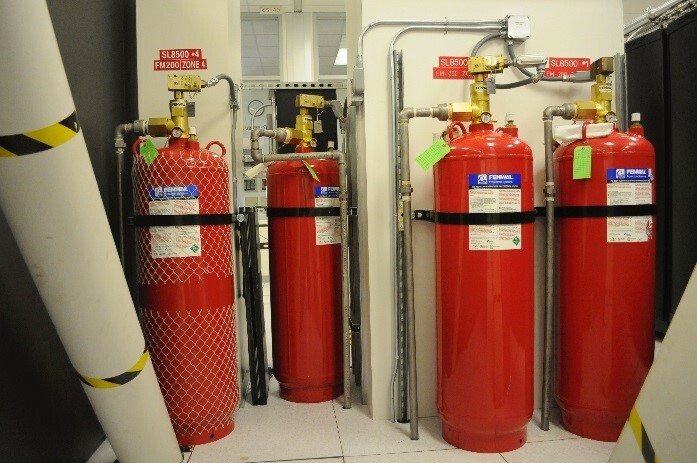 If you have questions about the best type of suppression system for your needs, Total Fire & Safety is an expert in installing, inspecting and maintaining these systems. Contact us today for an appointment at 630-960-5060.